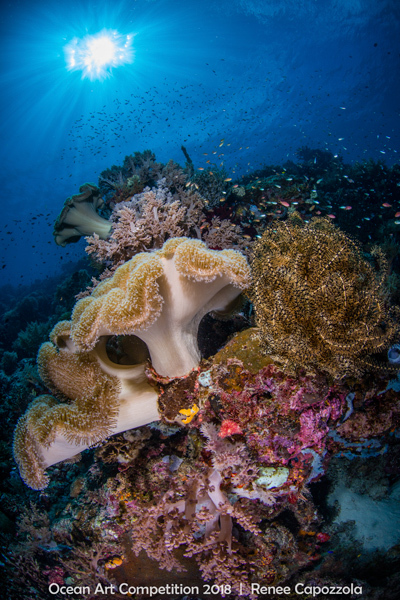 The Story: On the last day of my "East of Flores" liveaboard trip, we were diving at Pulau Babi which has a beautiful reef full of soft corals and sponges. Because we were diving in the morning, the sloping wall looked up into the sun so I decided to concentrate my entire dive on "sunbursts." I used a small aperture, high shutter speed, and low ISO to achieve this lighting. Because there was a bit of current during the dive, it was helpful to have my settings dialed in so after a few test shots, I was ready to find a nice composition and shot this image.